Go Direct Temperature can be used as a thermometer for experiments in chemistry, physics, biology, Earth science, environmental science, and more. The Go Direct® Temperature Probe is fully supported with LabQuest 2 (version 2.8.5), a standalone data logger with built-in graphing and analysis software. Connect Go Direct Temperature to the included Micro USB Cable and any USB device for two hours. You can also charge up to eight Go Direct Temperature Probes using our Go Direct Charge Station, sold separately (order code: GDX-CRG). An LED on each Go Direct Temperature indicates charging status. Blue LED on steady while sensor is connected to the Charging Cable or Charge Station. Do not put directly into flames. 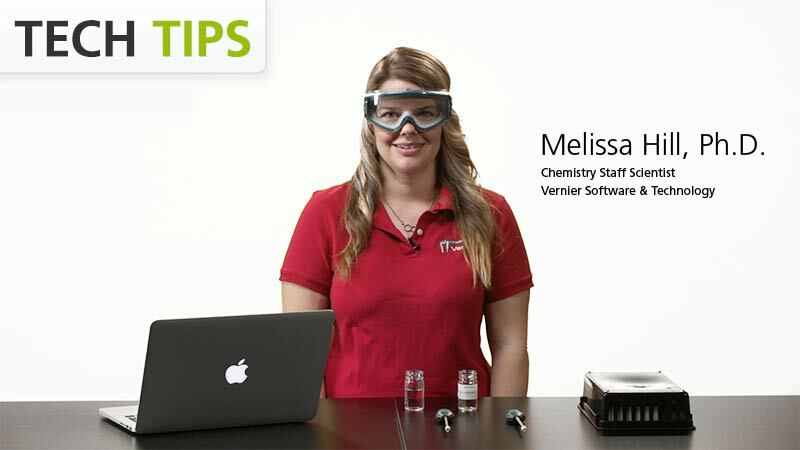 In this experiment, our Chemistry Staff Scientist, Melissa Hill, PhD, studies temperature changes caused by the evaporation of two alcohols and relates the temperature changes to the strength of intermolecular forces of attraction. Data are collected using two Go Direct Temperature Probes and our free Graphical Analysis™ 4 app. An inquiry approach is presented using prediction tools included in the app. Go Direct Temperature cannot be calibrated by the user. It is custom calibrated before it ships. Overheating the sensor is the most common cause for this sensor to break. When used in chemistry labs, students will sometimes lay the sensor on a hot plate and effectively "cook" the unit. The probe handle is constructed of molded plastic. While this material is chemically resistant, we recommend that you avoid submerging the probe beyond the stainless steel part into anything but water. The stainless steel portion of the probe can be left continuously in water at temperatures within the range of –40 to 125°C. Continuous usage in saltwater will cause only minor discoloration of the probe, with no negative effect on performance. Go Direct Temperature contains a small lithium-ion battery in the handle. The system is designed to consume very little power and not put heavy demands on the battery. Although the battery is warranted for one year, the expected battery life should be several years. Replacement batteries are available from Vernier (order code: GDX-BAT-300). To store Go Direct Temperature for extended periods of time, put the device in sleep mode by holding the button down for at least three seconds. The red LED will stop flashing to show that the unit is in sleep mode. Over several months, the battery will discharge but will not be damaged. After such storage, charge the device for a few hours, and the unit will be ready to go. The Go Direct Temperature Probe can be submerged in water for limited periods of time. It has been tested to a depth of one meter for up to 30 minutes. However, submerging the sensor impacts the radio operation by absorbing much of the energy. This may make it difficult or impossible to connect to the sensor while submerged, particularly if there are electrically noisy signals nearby, such as pumps or motors. If you have watched the related product video(s), followed the troubleshooting steps, and are still having trouble with your Go Direct Temperature, contact Vernier Technical Support at support@vernier.com or call 888-837-6437. Support specialists will work with you to determine if the unit needs to be sent in for repair. At that time, a Return Merchandise Authorization (RMA) number will be issued and instructions will be communicated on how to return the unit for repair.